We all want to live a rich life, whatever that means. Some people want money and power, others want prestige and recognition. Some of us just want respect, and most everyone wants happiness. Americans want big houses, nice cars, private schools and the best for their kids. Millennials want to make a difference and Baby Boomers want a good retirement. I believe everyone wants freedom. Freedom to spend their time and money the way they want. No matter your definition, in some way we all come to work looking for success. It is the leader’s job to get people motivated to achieve success! Time and again, leaders struggle to motivate their teams. Why is that? If people come to work looking for success, why can’t leaders get their teams motivated? The answer is simple, most leaders drive their people to focus on the wrong thing. To effectively motivate your team, get them to focus on the difference between where they are today and where they want their life to be. The gap between where they are and where they want to be can be a very motivational thing. This gap creates potential energy. Like a ball at the top of a hill, all it takes is a little push to get it rolling. Using the power of the gap and releasing the “pent-up” energy is how we motivate. Although everyone has this pent-up energy, not all of us stay focused on success. Instead we stay focused on our problems. I heard a motivational speaker say, “If you are focused on your problems your goals aren’t big enough.” We experience disappointment and become discouraged at work when we run into obstacles and problems. Doubt and insecurity creep in when we personalize these problems. If we are rejected, ridiculed, judged, or if we fall short, it hurts. To deal with this pain, people go into survival mode and start to tell themselves that things are, “Good the way they are.” They start to think success isn’t worth it. If they think success isn’t worth it, they will never have it. That is the problem in America today. Mediocrity is an epidemic! If being average is okay, people won’t ever be motivated. If things get really tough, many people retreat and hide. This is even worse than being mediocre or average. If you are hiding from what it takes to succeed you will certainly fail! On a scale from 1 to 10, what is your potential? On a scale from 1 to 10, where are you at today? Having a person verbalize and quantify their unrealized potential is a powerful to motivate. Get them to work hard for their dreams…not for you! Failure can be defined as falling short of your potential, and no one wants to fail. Your potential is what determines your greatness. We all want to realize our potential and live a rich life. 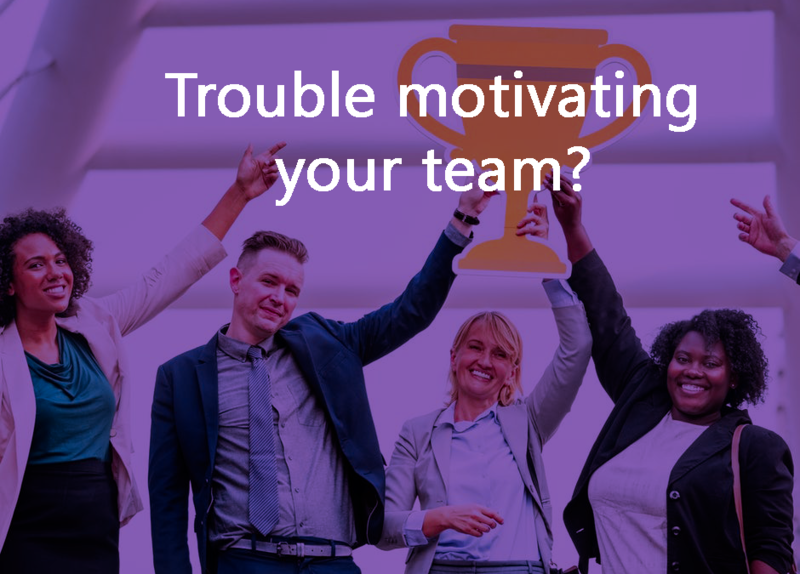 If we keep our team focused on their definition of success, reminding in a caring way that there is a sizable difference between where they are and where they could be…we can motivate them to do great things! In order to realize our potential, we must take action and overcome the inevitable difficulties that set us back and distract us. When we greet our obstacles with action, instead of becoming average or hiding from what needs to be done, we strive in order to live the rich life we have the potential for.